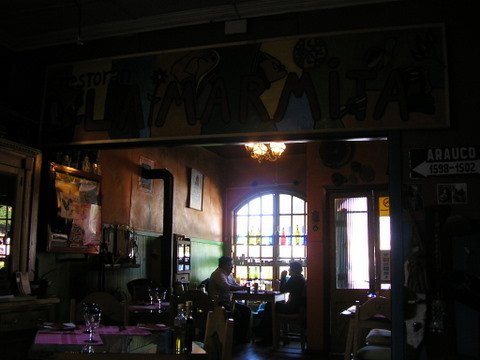 La Marmita is difficult to find at first but well worth the hunt. Plaza Sampaio is not listed on the city map issued by the tourist office - actually, it’s there as a tiny strip of green but with no name. I’m not quite sure how I tracked it down, but somehow I figured that little “bit of green” on Avenida Navarro, six blocks from the Plaza and just past Avenida Colon’s landscaped boulevard, might be the place. Fortunately it was. Avenida Navarro 678 was a pleasant old green house with wooden shutters. Inside it looked like a small lodge you might find in an Andean village in the north of Chile. 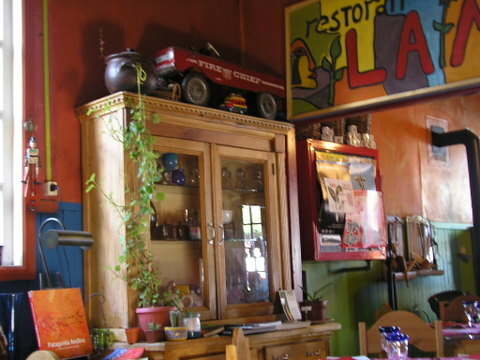 The room had an eclectic collection of Andean art along with old toys, brightly colored glass bottles and kitchen tools. A wood stove stood off to one side that was both a source of heat in petroleum scarce Chile, and the spot were espresso coffee was brewed and water for tea and mate heated. The tables were glass topped old wooden doors, retrofitted onto thick legs, with the insets of the doors decorated with stones, blue glass “beads” and an old photo or two of northern Andean life. The table ware was very modern. The contrast of old and this touch of new worked comfortably. The cuisine exceeded the visual. 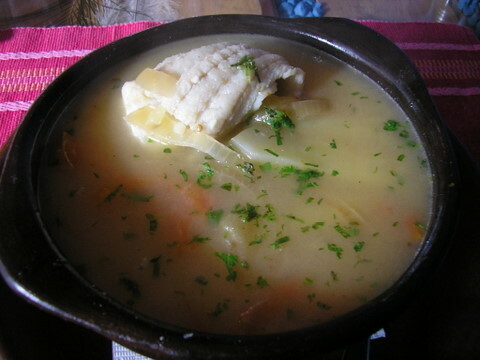 I started with one of their signature dishes, Pablo Neruda’s Conger Eel soup. The Nobel Prize winning Chilean poet was fond of recording his favorite recipes and his own creations. Based on the excellence of this soup, he was an accomplished cook. Besides generous chunks of conger eel, there were mussels, clams, potatoes and tomatoes in a cilantro scented fish broth. Served in an appropriately rustic, large brown pottery bowl with crusty bread it could have been a meal on its own. Main course was braised Lamb in Red Wine. The lamb was succulent with a rich lamb flavor that is only achieved when the animal hasn’t been artificially raised - the full flavor that, unfortunately, too many Americans do not appreciate. The side dish was an artistic creation. Chileans enjoy a flat bread cracker with a small black seed similar to poppy seeds. La Marmita formed the dough into a small free-form bowl and stuffed it with a mixture of carrots, mushrooms, tomato and corn. It was an imaginative and appropriate side to the lamb. 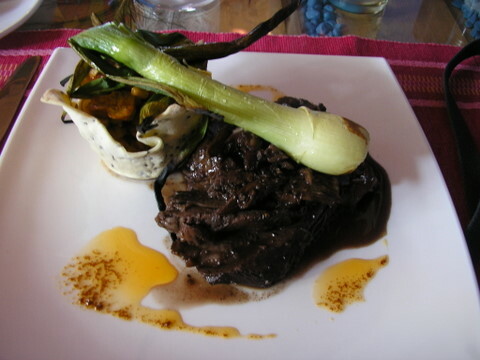 Despite the fact that I enjoyed the lamb, braised meat can lose it’s moisture when out of its humid cooking environment. When eaten with the excellent red wine cooking sauce, it was superb, but when eating a piece that was out of the sauce it had turned dry. Simply serving more sauce would make the dish nearly perfect. I never tell a restaurant that I am a Chef. But at the end of the meal, the waiter noticed my cap (which has “Chef” embroaded on it) that I had sitting on the seat of the other chair at the table. He invited me into their kitchen, a nice clean space, to meet the staff, mostly in their 20’s, and the Chef, not more than early 30’s. They seemed genuinely pleased that a fellow Chef from a foreign country had enjoyed their meal, and an excellent meal it was. Dinner came to CH$13,500 (US$24). Their wine list ranged from CH$4,000 - $20,000 (US$7.00 - $35.00) per bottle. 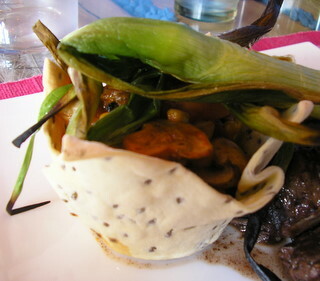 La Luna is on the tourist map without tourist pretensions. The interior is on three split-levels with blond woodwork and pleasant vocal music playing in the background. The menu is a nice mix of seafood, fish and meat dishes with a varied selection of sides: salads, vegetables, soups and appetizers. A small basket of warm rolls and a cilantro salsa, with just a touch of heat, started the meal. My first course was Calamari Pil Pil, tender circles of squid in a green pepper broth that also had a touch of heat, but, unfortunately, too much salt. The calamari itself was not affected by the salt since the broth was thin, but the salt made eating the broth impossible. 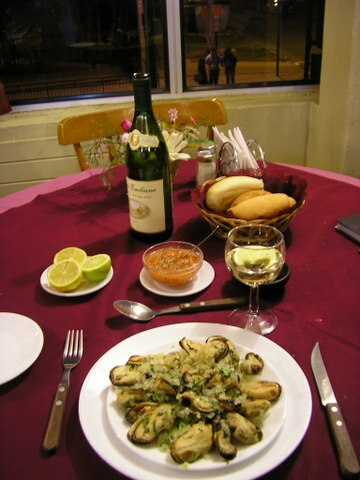 Main course was sautéed Conger Eel, a new experience and a specialty in Patagonia Sur. It’s a member of the large and varied family of eels found worldwide. The Conger can grow up to six feet long. 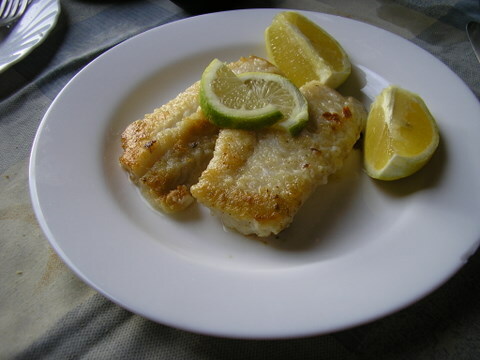 Its fillet is an inch thick and has a firm white-fish texture with a taste that hints at crab. I liked the fact that it was simply served with lots of fresh lemon slices. My meal came to CH$10,250 US$18). In general prices in Chilean restaurants are approximately 10%-15% higher than in Argentina. 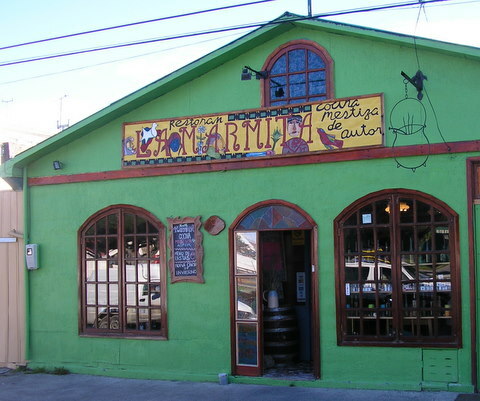 La Luna has an attractive bar with an extensive wine list specializing in the bodegas of Chile and Argentina. Prices ranged from CH$4,000 - $20,000 (US$7.00 - $35.00) per bottle. El Mercado is an unassuming restaurant on the second floor overlooking ordinary streets one block from the Plaza and is good for the budget-minded traveler. It has a pleasant atmosphere with fresh flowers on its blue and white cloth tables, even if the flourescent lighting is a bit too bright. 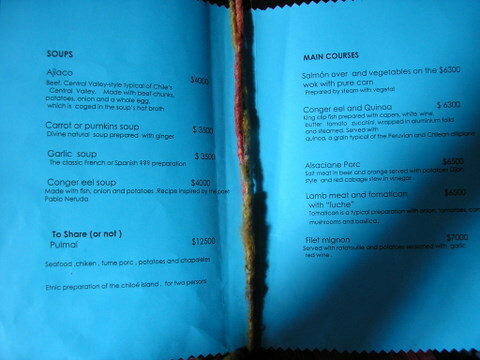 Like most Punta Arenas restaurants, its menu was a nice balance between fish/seafood and meat. I started with a cold mussel salad. 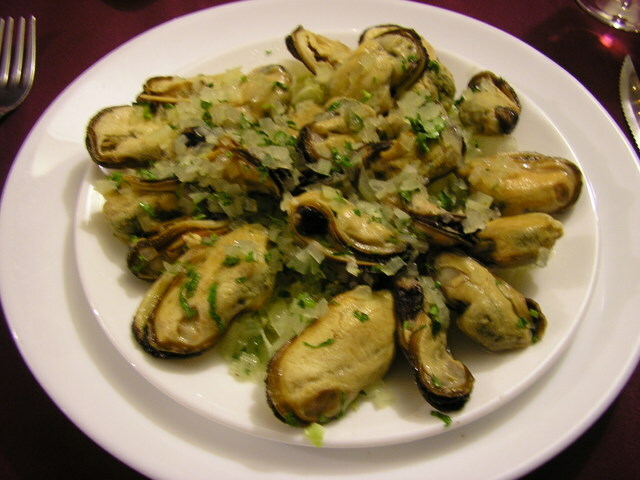 Thirteen plump, nicely arranged mussels arrived, garnished with parsley and thick lemon wedges. The mussels were steamed to perfection but there was no seasoning. I added salt, pepper and the salsa that was brought for the bread and was pleased with the result. The main course was an excellent grilled Hake, lightly seasoned so that the full flavor of the natural fish was evident. 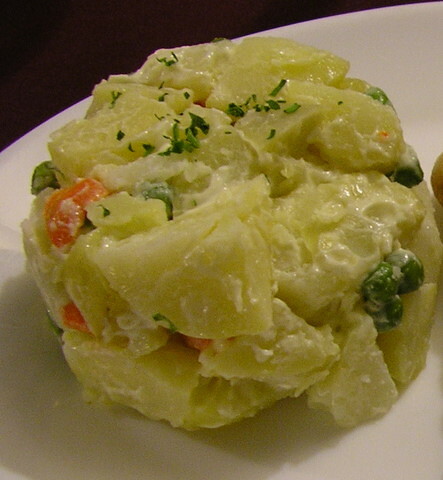 Chile and Argentina are fond of Russian Potato Salad, which has chopped carrots and peas. Often I’ve had Ensalada Russe smothered in mayonnaise, but this had just enough to bind it together and was the best I had in a restaurant. El Mercado had a modest wine list and reflected the same selections and prices of the other Punta Natales restaurants. My meal with a glass of wine cost CH$10,250 US$18). Café Net is a comfortable, friendly internet café and restaurant just one block off the Plaza. It had both the traditional booths for renting net time with state-of-the-art computers and hi-speed connections as well as fast WI-FI connection for patrons that brought their own computer. The only requirement if you used your own computer is that you purchased coffee, a drink and/or food worth CH$2,000 (US$3.50) per hour. Both their espresso and food were very good. My first visit I asked for a cappuccino and got a Starbucks-like creation with good espresso topped with fresh whipped cream and chocolate shavings. A sandwich I ordered on one visit was the classic ham and cheese but this came on a giant, fresh roll with lots of lettuce, tomato, thick slices of fresh baked ham and good fresh white cheese for CH$2500 (US$4.38). I’m sorry I didn’t try the entrees at Café Net. It was the best net-café on my entire trip!